Among the many tasks in incorporating a business, none is more important that selecting a board of directors. In this article, we'll look at the board, and the information you will need to select board members and guide them in their duties to help in your corporation. The Board of Directors of a corporation is the group of individuals who are charged with running the corporation. The board of directors is sometimes called a board of trustees (for a non-profit corporation), a board of governors, or executive board. Before board members are selected, the corporation needs to have bylaws, rules that govern the duties and actions of the board members. Everything the board does is set by these bylaws. Once the bylaws are in place, the board members can be chosen. In a public corporation, the board is elected by the shareholders. Selecting the board of directors in a startup company where there are no shareholders can be done by the President or CEO of the business. Board members should be selected for their ability to help move the corporation forward and provide oversight and guidance, not for friendship or political purposes. What Are the Duties of Board Members? The duties of the board of directors and officers of the corporation are set by the corporate bylaws but are also set by law, specifically by the laws of the state where the business is incorporated. The board as a whole is responsible for the finances and legal requirements of the corporation. In addition, they must set the mission and vision of the corporation, and set policy for corporate officers and employees to follow. Board members do not participate in day-to-day operations of the company. What Officers Should a Board Have? The board should have a board chairperson, a vice chair, a secretary, and a treasurer. The duties of each officer should be set out in the bylaws. Board officers should not be executives of the business itself, because of conflict of interest principles. What Goes on at a Typical Board Meeting? Board meetings should follow a standard format, including the use of Robert's Rules of Order or some variation. The meeting begins with the approval of the minutes of the last meeting and review of the treasurer's report. If there are committee reports, these are presented. Old business is discussed and voting is recorded in the minutes. Then new business is discussed and possibly voted on before the meeting is adjourned. Board meeting minutes are taken by the secretary in a specific format. The overriding duty of a board is to put the interests of the corporation first. This is the board's fiduciary responsibility. The fiduciary relationship of a board to a corporation is one of trust. Board members must sign a document agreeing to accept their fiduciary responsibilities. If anything goes wrong in a corporation and the board or individual members breach their fiduciary responsibilities, they can be taken to court. The board members have several types of liability. They must act on behalf of the shareholders (no conflict of interest), and they must not co-mingle personal and corporate funds. 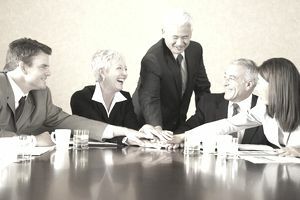 Many boards formulate and agree on a conflict of interest policy, stating that board members cannot let personal interests influence their decisions on behalf of the corporation or its shareholders. In addition, many corporations purchase officer and board member liability insurance, to protect the corporation against lawsuits against board members and also to prevent board members from being sued personally. Some corporations compensate their board members, with compensation based on the type and size of the corporation. Many corporations, particularly non-profit corporations, do not compensate board members but instead provide them reimbursement for travel expenses to board meetings and other corporate locations. Board members of publicly traded companies may be compensated with stock options, but in any case, the compensation of board members should not be so much that it is the primary incentive for individuals to agree to be on the board. One of the most important legal requirements of a corporation is to have an annual meeting of shareholders. The corporate board is responsible for the annual meeting, which usually includes an annual report of the state of the corporation. There are specific requirements for what must be included in the agenda for an annual meeting. There are several ways to remove a board member. The best way is to have term limits, so members are automatically removed when their term is up. Other less pleasant ways to remove a board member are personal intervention and dismissal. The corporation is the only business type that is specifically required to have a board of directors. But other business types may have governing boards that work in the same way. An LLC can set up a board of directors by creating by-laws that spell out the board's duties and how it operates. Some limited partnerships have a board because the limited partners have no say in how the business operates.